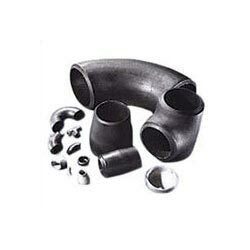 We are one of the leading names in the market for manufacturing, exporting and supplying of Carbon Steel Buttweld Pipe Fittings. We are offering wide assortment of Carbon Steel Buttweld Fittings such as reducing elbow, equal tee, unequal tee, crosses, concentric reducer, eccentric reducer and many more. They are available in various shapes and sizes. Robust construction, corrosion resistant, accurate dimensions, maximum bearing capacity and durability are some of the salient features of our Carbon Steel Buttweld Fittings.